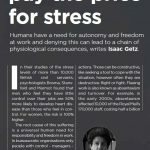 We have written in Freedom, Inc. on the invisible costs of traditional companies and illustrated it through the costs of the workplace stress. Of course, there are others and the early exponent of those was Deming. Here is a quote from his 1982 book Out of Crisis. Visible figures showed that the credit department of a company had succeeded in retaining mostly only customers that pay promptly. The credit department had performed well on me job allotted to them. They deserve a good rating. Figures not so visible, it came to light, showed that the credit department had driven to the competition some of their best customers. Top management looked too late at the total cost. As the outlook for a company grows bleaker and bleaker, management falls heavier and heavier on the comptroller for management by figures. In the absence of knowledge about the problems of production, the comptroller can only watch the bottom line, squeeze down on costs of materials purchased, including the costs of tools. Machinery, maintenance, supplies. Neglect of the more important invisible figures unknown and unknowable, on the total costs of these moves, causes further shrinkage of profit from whatever business remains. Thanks, teeth whitening, for your feedback. Would be interesting to hear why don’t you agree with Deming here.